Experience your best ride with boots that maximize protection and control. 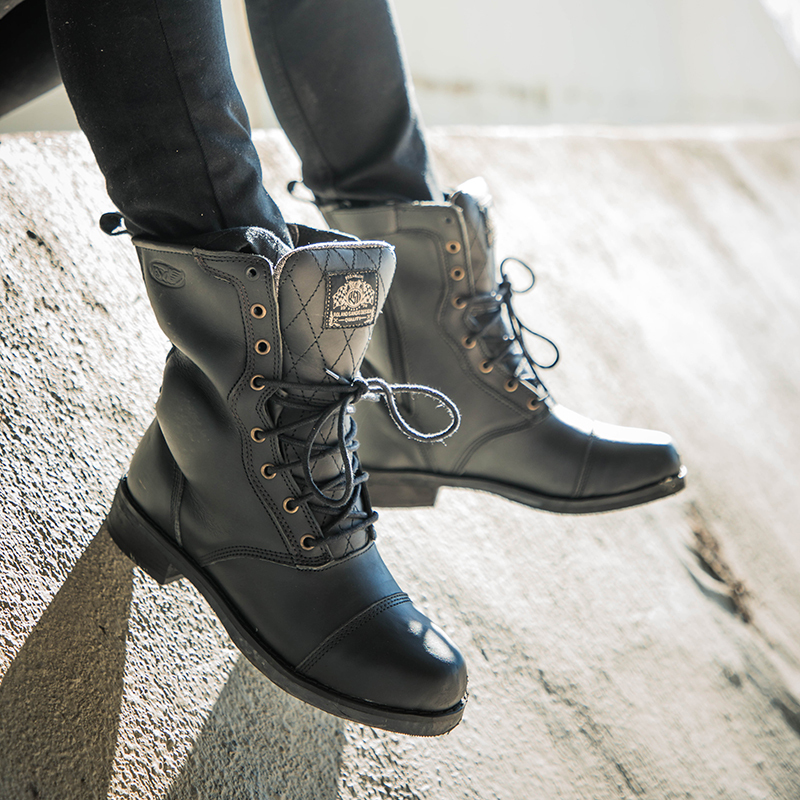 Women's motorcycle boots provide an essential piece to the gear setup for a safe and comfortable ride. Sure, you can ride in any old boot but women's motorcycle boots offer specific protection, fit, and function you wont find in average footwear. Your feet do a lot on the bike from shifting gears, controlling the rear brake, to weighting the pegs. Give them the protection and comfort they deserve. Find the best boots by shopping for your riding style and pick up a how to on sizing information to get the right fit. We know just how tough this decision can be so we've put together our best tips to help guide you to the right pair of boots that will make your next ride your best ride. Built specifically to serve as an interface with your bike, women's motorcycle boots help maximize protection and control. There are a variety of styles available each with distinct benefits for the type of riding you prefer. We get it. Finding the right size is tough enough. So we want to make that as easy as possible. Before you order, check out our sizing tips below. Built specifically with the aggressive woman rider in mind. Women's sportbike boots are crafted to meet requirements needed for track days so they carry the utmost in protection for motorcycle boots. Sportbike boots come reinforced with sliders where racers feet commonly contact the pavement during a turn. 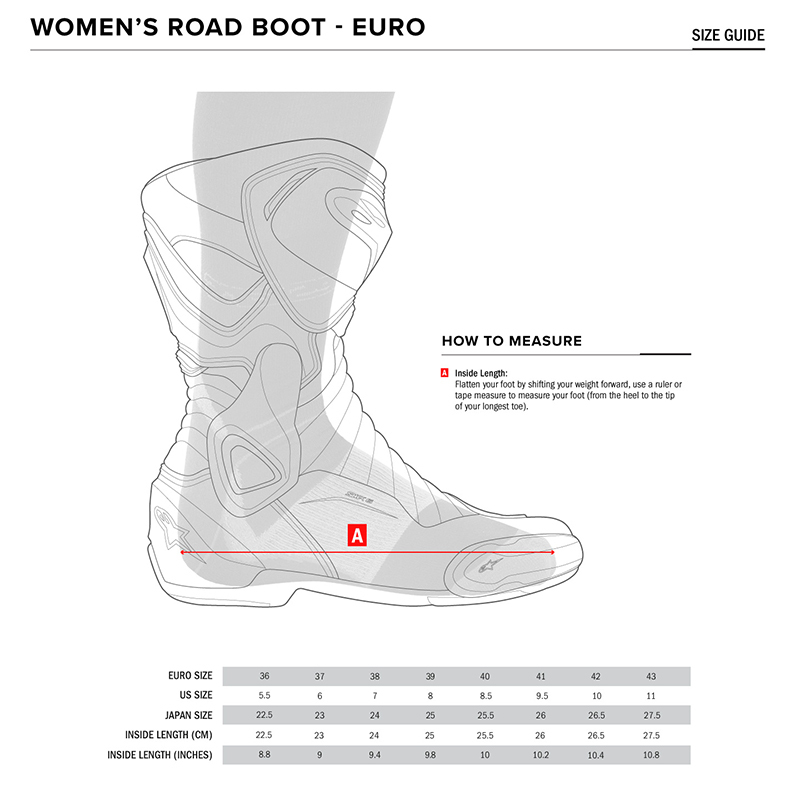 Additionally, women's sportbike boots have armor in high impact areas. While not as comfortable as other boots sportbike boots offer the highest protection for riding motorcycles. Women's motorcycle shoes resemble your average street shoe but go far beyond in protection and comfort on the bike. Women's motorcycle shoes offer a great compromise for the rider looking to have a comfortable shoe they can wear on and off the bike without sacrificing protection. Taking you from the bike to the cafe. Women's cruiser boots are extremely popular and offer a traditional style with quality protection. Commonly built with reinforced leather, cruiser boots offer great style and protection. From adventures across the Continental Divide to racing on the motocross track, women's dirt bike and motocross boots are built for protection in the most extreme environments. Because of the nature of dual sport, dirt bike, or motocross riding these boots withstand whatever nature can throw at them. Finding the right sized women's motorcycle boots can be the difference between a memorable day of riding and a miserable one. As we mentioned earlier your boots are an interface between you and your bike. From rider to rider we are committed to making sure you have the right fit for the best ride possible. If you have trouble with a pair you ordered we offer a free first exchange program. Order any gear through us and if it doesn't fit we cover the first return shipping to make sure you've got the right size. 1. Always reference the size chart available on the product page. You may be a certain size in one brand but a completely different size in another. 2. Measure both feet because most feet are not perfectly symmetrical. 3. Get to know your size in Euro. Euro sizing is much more consistent as it is the same across the board for men's and women's shoes. 4. Pay attention to reviews from other women as the riding community is a great way to judge size consistency. 5. Take riding socks into consideration. More than likely, the socks you wear while riding are much thicker than your average daily sock. 6. Take riding position into account. A boot that fits ok standing may not feel exactly the same when you're on the bike. As with any gear, always try it on in your typical riding position. 7. 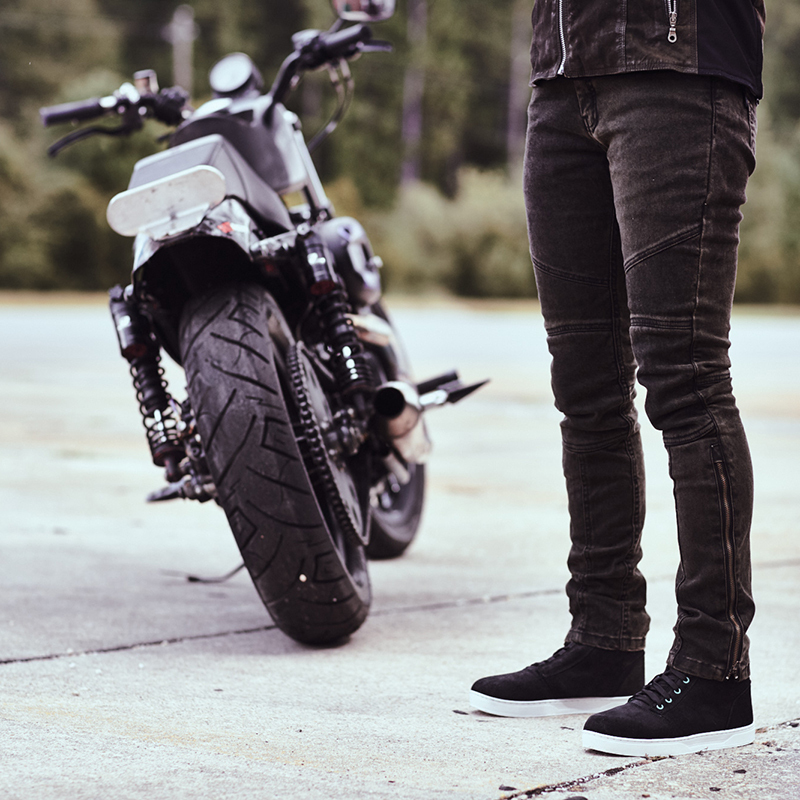 If you are still having trouble finding the right boots for your riding style, try shopping for men's motorcycle boots in your size. We offer many boots with a wide size range to accommodate as many riders as possible.